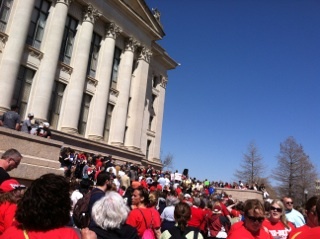 On March 31, over 25,000 educators were estimated to be rallying at the capitol. The Oklahoma Education Coalition sponsored a rally at the state capitol building to protest funding cuts for Oklahoma public schools. School districts across Oklahoma closed school for the day and bused their educators to Oklahoma City for the event. With signs in hand and persistent spirits, Oklahomans are finally taking a stand for their devastatingly limited education support. So, as Governor Mary Fallin put it, “What protest?” Well, these educators are calling for an increase in public school funding. Oklahoma is ranked 49th out of the 50 states for per-pupil expenditure. This, along with the lowest salary rate for teachers in the nation, were the main issues that initiated the rally. 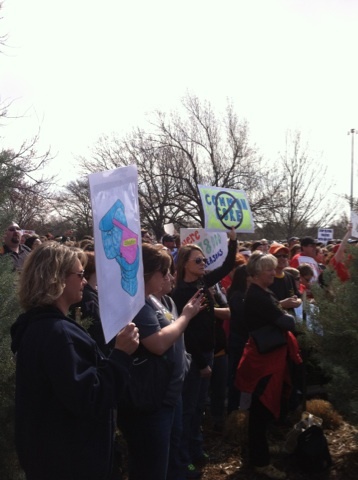 However, there were many other issues in Oklahoma public education that fired up the protestors. The day was scheduled to begin at 10:30 am. People were advised to park at Remington Park and the Oklahoma Education Coalition made arrangements for shuttles to the capitol building. However, it was soon realized there was not enough transportation. There were 4 shuttle buses that had been arranged, which was not nearly enough for the said 25,000 educators who showed up that Monday. Buses from school districts across Oklahoma gladly joined the efforts to get all the educators, parents and students to the capitol so that they could make their impact. The Oklahoma Education Coalition sponsored this event based on the campaign of 678,000 reasons why Oklahomans need to be standing up for education, alluding to the number of students enrolled in Oklahoma public schools. While the funding is important to receive, educators were really asking for the focus of public education to be put back on the kids. People held signs up at the rally that proclaimed things such as, “Stop playing politics with our kids,” “Our students are worth more than 49th” and, a personal favorite, a picture of the state of Oklahoma with education written on it going down a toilet. Among the protesters were students themselves. Some held signs that read “Is my education not worth it?” and “Make some change so you can change our future.” Another fiery issue among the educators is the emphasis on testing in the classroom. Protesters held signs reading “Students are more than a score,” “Let teachers teach” and “Rotten to the core” [referring to common core curriculum]. These teachers did not just come to protest. They came with resolutions. There is potential for $360 million state revenue that could, in part, be available to public education. The ralliers were asking legislators to vote yes for House Bill 2642, which would allow for an annual automatic funding increase titled the “Securing Educational Excellence Fund.” Through the appropriations of the income tax and tax incentive programs more funding could be given to education. 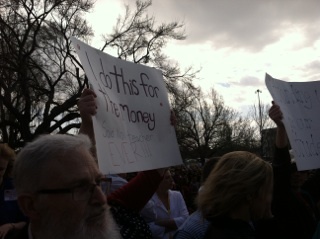 Teachers went inside the capitol building during the rally to personally address their legislators and lawmakers. With 2014 being an election year, the Oklahoma Education Coalition asked educators, parents and students to fight for the need for better funding. They simply asked people to try to be in Oklahoma City on the day of the rally. The turnout exceeded everyone’s expectations. The state Superintendent of Schools said, in regards to the rally turnout, it was “a testament to the importance of education.” Yet, Janet Barresi did not make an appearance at the rally and neither did Governor Fallin. As educators gathered on the south side of the capitol building, facing a line of legislators and holding signs calling for change, Oklahoma teachers took a stand, showing education is not to be forgotten. I really believe OK school systems should really step it up! It’s ridiculous that we’re so far behind compared to other states. I really hope their voice was heard, and that government will be willing to make some changes to improve education systems!